Cathy is a formidable student. She displays a rare combination of humility and earnestness. Her quest for knowledge comes from an urgency to bring the very best to each person she encounters in a spirit of service and compassion. She approaches those who come to her as equals, understanding that each brings a vital opportunity to grow in consciousness together. Cathy carries an authentic light that inspires, grounds and soothes. Her classes create space for her students to let go and deepen awareness through yogic philosophy and challenging sequencing. I cannot wait to practice with her again! Cathy's yoga class is the perfect combination of muscle work, stretching and relaxation. She is extremely helpful, patient and always willing to help you modify or even skip a pose. Her calm demeanor and soothing voice make Savasana the best part of your day. I have known Cathy for 10 years, and over the last 4 years, I have taken her class in a variety of venues. Regardless of the class size and ones ability, she always makes you feel special and is eager to help you. She is calming and inspirational, a perfect yoga teacher! her modifications are geared to each student's unique gifts, and her sequences respect the needs of the athlete at various points in the training cycle. I give her the highest recommendation--if you are anywhere near Roanoke, seek her out! Cathy helps individuals push to, and beyond, the edges of their limits while acknowledging and allowing for differences in their skills and goals. She meets you where you are to get the most our of her yoga classes. In our hurried world, Cathy Cannon is a breath of fresh air. She takes the time to listen to her clients and make the yoga session unique to them. Not only does she have a soft and kind way of speaking, but she is SINCERE. I am fortunate enough to have Cathy teach at my home studio. She truly is the heart and soul of our space. Cathy persistently reaches enlightening pinnacles in her yoga teachings. She is a force of calm, motivation and inspiration that adds connotation to the day and beyond. I have been practicing yoga for about 5 years. Cathy is the main reason I have stuck with it. She is a terrific teacher and an inspiration to me. She is always well prepared for each class and makes sure that each session is unique. I have benefited immeasurably both physically and spiritually due to her leadership and fine patient teaching. 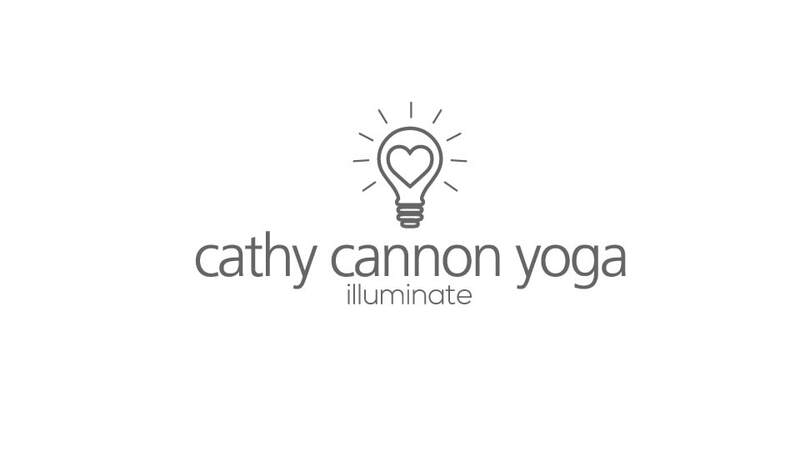 Cathy Cannon is a transcendent yoga instructor. She has risen above the normal teacher grading scale because yoga is not something she does, yoga is something she is. That is not a woo-woo claim, but something she has created through consistent, years long practice and study. You won't find a finer yoga instructor. Cathy is an inspiration to those who practice with her. She has a true energy to enlighten your mind while working your body. You cannot walk away from class without feeling renewed and ready to conquer your day. I first got to know Cathy as a thoughtful Mom who has given her girls the gift of confidence and creativity. Only to meet her a few years ago in the yoga studio, her patience and professional practice has made me a better person. Her joy for the accomplishment of those in her classes shows in her smile!